On the jacket: He flirted with her for five days; she waited for him for five years, only to be shattered irrecoverably one day. Logic seems to be winning the battle, until destiny refuses to move on and adamantly brings them face to face again. In life’s moments of struggle and comfort, the heart and mind must join hands to combat. A love story dedicated to the generation that never values what comes easy. Wish a few logics were a little less stupid. But nevertheless… Logically Stupid, That’s Love. Review: You always feel better after reading a nice book. Sometimes it will leave a spell on you. It won’t go off from your mind that easily. And Logically Stupid, That’s Love is one such book that I picked up this year and it had a spell on me. As I kept on flipping the pages, reading the story of Kartik and Sahana, I did feel a tug of emotions brewing inside me. Alas, it all came to an end with a happy yet a dramatic climax. The authoress has brilliantly portrayed the central characters Kartik and Sahana. The plot itself is superb with full of twists and turns. The characteristics of the central characters gives it a shade of a love story which is bubbly and the one which is aptly suited in the 21st century. The authoress had a lot to tell in the story and for not even once I felt that she had gone overboard in detailing some scenes. Thus, it renders the book to be a quick page turner. I am also amazed at the way that such simple English can bring out the best of the emotions in me while I was reading. Logically Stupid, That’s Love is one such book which I may come back again to read only for the way in which it is written. Moreover, I didn’t find any proof reading errors. 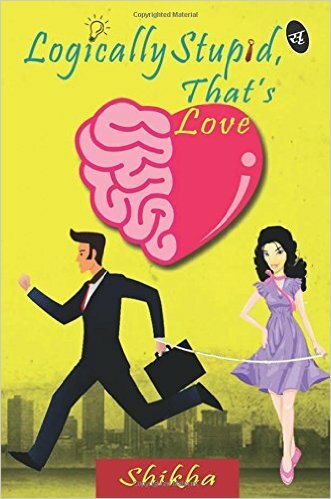 Overall: Logically Stupid, That’s Love is one such book that is perfectly suited to the Indian audience as it actually tells how Love happens in India. I would recommend people to grab this book and relish this beautiful love story.